What is Early Childhood and Family Well-Being? Supporting positive family and child well-being in the early years of children’s lives is increasingly recognized as an effective, and cost-saving, prevention strategy. Early childhood programs include a broad array of services including home visiting programs, child care and preschool programs, Head Start and Early Head Start, parenting classes, early intervention, and health-promotion strategies. 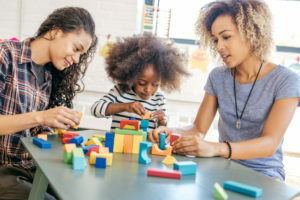 These programs share a common goal of facilitating the well-being of children in their early years, typically focusing on children under the age of six. Staff at NPC Research have conducted early childhood research and evaluation at the national and local levels, and bring a wealth of experience in how to design, implement, and evaluate early childhood and family support programs. While upholding rigorous scientific standards, NPC Research staff strive to evaluate early childhood programs using a strength-based and family-friendly approach and work closely with funders and program partners to ensure that evaluation findings are useful for program development and improvement. Key early childhood projects include partnership in the national evaluation of Early Head Start, the Healthy Families Oregon Evaluation, the Child Care Quality Improvement evaluation, the Child Care Enhancement Project evaluation, analysis of Early Childhood Mental Health Consultation strategies, Transforming Transitions to Kindergarten, and the State Incentive Grant for Early Childhood Systems evaluation.